Stacey Abrams supporters had a busy day Tuesday, Oct. 2. 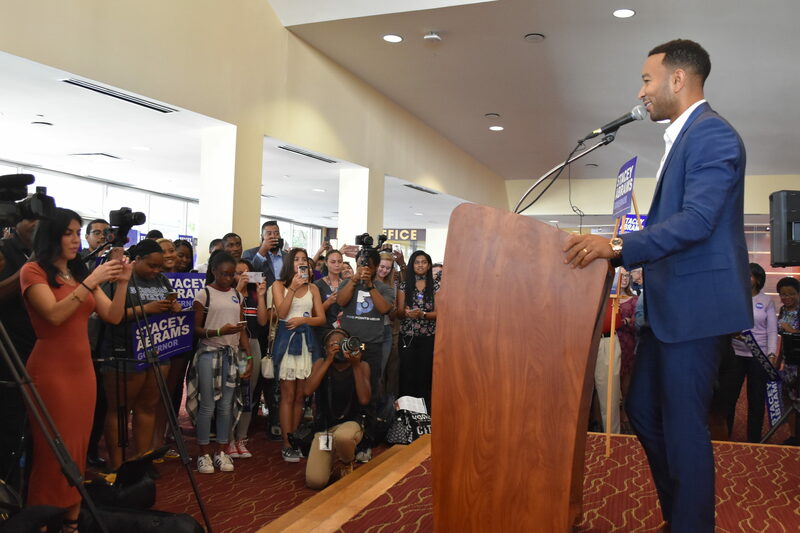 John Legend, Emmy, Grammy, Oscar and Tony (EGOT) winner, headlined an Atlanta college tour, which included Georgia Tech, Emory University, Morehouse and Spelman College. Georgia State got some love: Legend gave a speech and answered questions at the Rialto Center for the Arts. The busy day would finish with a campaign fundraiser later that night, hosted again by John Legend. Legend was adamant about the impact of local elections, emphasizing that in his busy life he finds it most convenient to vote by mail. Staying informed is essential to one’s political development, Legend said. The more voices he can pull from, the better he can act. In 2014, John Legend began Free America, a nonprofit campaign for criminal justice reform. He literally did go out and talk to folks in a national tour to educate himself and others. Free America is endorsed by the American Civil Liberties Union (ACLU), the MacArthur Foundation and the National Day Laborer Organizing Network. Ebony Carter is the President of the Young Democrats of Georgia State University (YDGSU). YDGSU was one of the contacts and hosts for the Abrams campaign event. “They called me last Monday. It’s Tuesday. We had a week,” Carter said. Carter said she has been so involved on the local level with YDGSU that she was unaware of Legend’s political involvement. Once she found out, she was more than eager to get involved. But there’s one local celeb she does recognize.